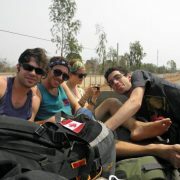 I met my four Canadian travel buddies crossing the border from Cambodia to Laos. We were instructed to give our passports over at the border while we waited on the bus for them to be stamped (Which seems like a bad idea in retrospect). The attendant came back with all of our passports and was shouting out all of our nationalities while he returned them. I, as per usual, was the only American on the bus, and Canadians tend to find this humorous. We ended up traveling through Laos together, riding bikes through the 4,000 islands, sleeping in hammocks, and drinking our way through the streets of Vientiane. We got the idea to hitchhike from 2 blonde girls who said they had done it and it was quite simple. We decided to give it a shot, as bus fees were all of four dollars and what better way to experience local life? Throwing caution to the wind and carrying our huge packs, we boarded trucks and accepted the kindness of locals who would stop and give us rides. After a day of riding with chickens, in the back of pickups, and receiving two marriage proposals from locals, I realized I was feeling quite sick. I was about to get food poisoning, and I was literally in the back of a pick-up in the middle of nowhere. The driver felt bad for me and dropped me off at a guesthouse, but there was no water available and I spent the night puking into a flush-it-yourself toilet. That being said, I learned a lot from this experience. At 19, many would have thought it was crazy to meet some strangers and hitchhike with them. Maybe it was. But even when I sick, even when I was at my lowest, people stepped in and took care of me. Travel can be brutal sometimes. You have to rely on the kindness of strangers and throw all the comfortable, familiarities of life out the window. However, when you do, you learn that the world is a pretty amazing place. You learn that sometimes it’s okay to just switch off the news and experience life the way it’s meant to be lived. You learn not to just to rely on others, but to trust in yourself. 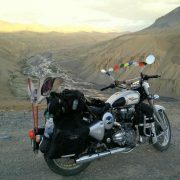 I’ll never forget the feeling of absolute freedom that I felt that day-hair blowing in the wind and laughing as we hurtled over bumpy roads and potholes. It’s one of those moments where you feel absolutely infinite, and when you find it, you’ll remember that feeling forever. Nusa Dua peninsula became one of my favourite spots in Bali during my six months of internship there. I am going to tell you about the moment I and my boyfriend visited the place for the first time. We lived in the capital but the peninsula was about one hour ride away from our place. 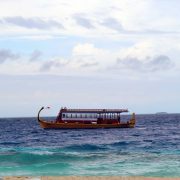 The ride was rather long and we already had heard the rumours about the corrupted police. Thus, we asked for some advice from a local. If you are a tourist, it does not matter if you are a law obeying citizen who follows all the rules or you break the law, drive without a helmet, a licence or don’t stop at a red light, the police will stop you no matter what. The local advised us to wear long clothes to cover our skin so we would be less noticeable. Also to have a little money in our wallet prepared for the police in case they will stop you and keep the rest of the money somewhere else. This way you can show the police that this is all the money you have and they cannot bribe you for more. Fully prepared, our ride could start. Luckily we did not meet any greedy policeman. Just the other day we stopped exactly on the stop line while a local feeling the need for speed passed us and drove through the red light. Guess who had to pay the fine? Finally, when we arrived, the beautiful white sand and blue water were greeting us. The peninsula was packed with restaurants and resorts. It is actually a very touristy place and usually, I am not very fond of mass tourism, but the place is so beautiful you cannot help but fall in love with it. The water was very clear with starfish peeking out once in a while. It was also very warm and made you feel like you are taking a hot relaxing bath. The sun was shining and nothing could be better. There is one special spot on there, a little island covered with trees donated from other countries and a viewing platform. A little disappointed not finding a tree from my country we went on to the viewing platform. This spot was amazing. 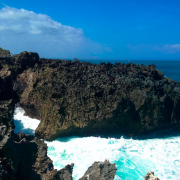 The platform was created on top of the rocks surrounded by blue water. You could just sit or stand there on the platform watching the waves crashing the rocks. Sometimes bigger, sometimes smaller splashes. You could notice small crabs climbing on the rocks underneath you. There was a huge group of people observing the waves, making pictures and videos. And suddenly the unexpected happened. A wave so strong and high hit the rocks and before you could even realise what was about to happen the whole crowd was completely wet. I gathered my thoughts being completely soaked and picturing myself sitting there ready to take a picture with my phone but the wave completely covered me instead. After that moment the whole crowd was squealing and screaming and running back to the ground, far away from the viewing platform. I could not help but laugh at the next site: all the people standing there soaked trying to dry themselves and their precious expensive cameras, smartphones and iPads. The people were all laughing too while screwing their technological equipment apart to dry. People, who just arrived, were not sure anymore if to go on the platform or not. Most people were cautious and the platform stayed empty for a while. I wish I had some rice to dry up my phone. I have heard that rice can absorb the moisture completely leaving the device undamaged. My phone fell into a coma and I had to get ready for a less funny moment when I receive the bill for the reparation work. Even thought my phone died I would still relive the moment. It was hilarious and exciting at the same time. And we kept going there afterwards, believe it or not, trying to get wet again. The following times we were smarter, though. One of us went on the platform and the other was left behind to capture it and protect our precious items. After being already wet we went for a swim in the warm glistening water and did some sunbathing on the white sand. We ended our day eating out at a treehouse restaurant. The restaurant had multiple treehouses and you could take a table on one of them. The waiters guided us to a free treehouse, which had three floors and we took the top floor. I was surprised how the waiters could climb the trees every day and carry dishes and drinks to people. The place had a big table and you were sitting on the ground on some cushions. And so we sat back, relaxed and enjoyed our meal. This was the perfect ending to our day. Bellies full almost dried up and smile on our faces. “Wow, you’re cool! Alone? Are you crazy? To travel 6 weeks in oriental SE Asia! You’re really good! Is it ever safe for a woman? Well mainly, that you survived, the plane did not fall with you, nobody robbed you, raped etc.” The most common reaction of the family and friends of mine to the question how I enjoyed my trip to the other side of the globe. “And didn’t you travel there to see a friend?” It’s possible to make a life decision within 24 hours? I will be traveling alone and enjoy it BUT what if!? Also, can you think of a million reasons why not? I had about a thousand of them that were running through my head. My brain paths worked at 120 %. Then I saw myself in my mind how I will go defeatedly back to the Czech Republic. BUT I’ve faced a life challenge! ME, the first time ALONE in Asia! God, maybe I’m crazy?! I collected the last bits of courage to take a deep breath. I let the feel of the thrill from the unknown flow through my body, the feel, which has been ruled by a fear so far. How big of a little fool am I, I have no idea at the moment. I’m lovingly opening my heart to the knowledge of a new country culture. My steps lead me forward into the unknown across the bridge of fear. I didn’t have an idea where I will sleep tomorrow, who could cross my path and where the wind will take me. I only knew one thing. It will never be the same from right now at this moment. “Madam, madam…” From the deep contemplation, I am awakened by the impulse of the waiter. I am given another great chilled coconut cocktail. The sips of coconut milk are so delicious that it’s easy to forget about the outside world. Again I am immersed in the thoughts about the decisions in the past few weeks… “And now, after 10 years, when I was standing face to face in this chance, I was paralyzed with fear. But why was that? Perhaps because I am an adult? As we get more and more mature and advanced, we deal with unimportant things. We are accustomed to our convenience in the comfort zone. Our point of view of courage is controlled more by head than by heart…” I’m sipping the last sip of the coconut milk. I know that my decision was correct. I listen to the heart more, my heart, the heart that experiences my joys but also worries with me daily. I do not regret for a second! At the same time, it has been the craziest and coolest step forward on this fateful crossroads of life. I have gone beyond my comfort zone to find freedom of my life story. 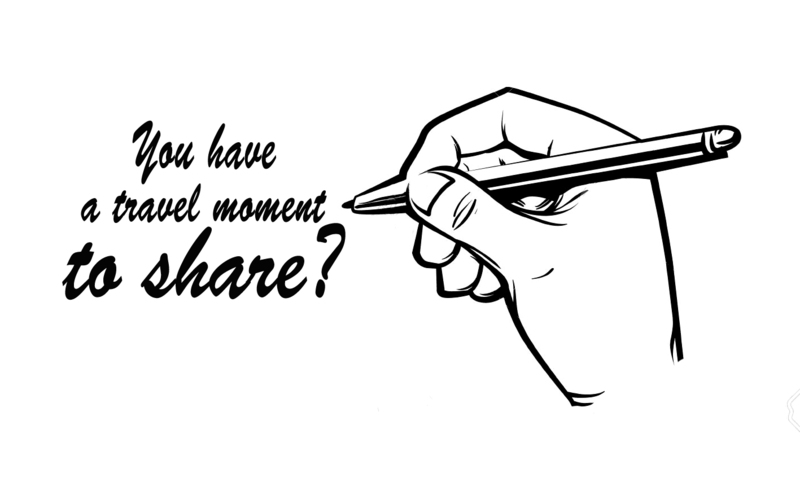 The story that I want to write with a pen filled with the experiences that I lived in the moment, here and now! The sun slowly conjures a symphony of colors on the surface of the ocean. I am cheating on my favorite coconut cocktail with a delicious mango shake. Traveling in a backpacking style, with eliminating extra kilos to the minimum necessary evil on my back, it is a wonderfully liberating feel. Nothing ties you up. You are as free as birds. But it does not change the fact that I like giving gifts to the family and friends of mine, the souvenirs from my travels. I am coming back to the roots of our grandmothers, several decades back, to the days when the world was ruled by the postcards. “Still two hours remaining until the departure of the night bus”, I’m telling myself. The heart is already crying with Thailand-sickness, the time to send the last postcards from Thailand. I’m pulling a couple of them from my backpack. With the pen in my hand, I’m hardly pushing a glistening tear in my eye which falls and rolls down on the last postcard. Tomorrow morning it will only say from Malaysia. I feel in my heart that I’m not giving my last bye from Thailand. Living in a tree house was a dream of mine since I was a kid. There is just something so peaceful about climbing into the trees and nesting yourself its branches. My dad built me a tree house when I was younger; I used to spend hours and hours up there, reading a book or just spying on the neighbours. While Angus and I was planning on Thailand trip, I found that my dreams could be a reality. 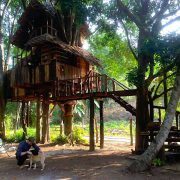 I discovered the Chiang Mai Tree House, a family-owned tree house resort located about 45 minutes from the actual city of Chiang Mai. It was a “must do” on my list, and I immediately booked us a few days in one of their infamous tree houses. Our time there was a dream come true and a half. Mink, one of the managers, warmly welcomed us when we arrived. He proceeded to give us a small tour of the resort, and I gazed in awe at the place. We were in the middle of a small village, in a lush, tropical area brimming with trees and wildlife, and surrounded my multiple tree houses. Some were 15 meters high, with steps spiralling around the tall trees. Some were larger and surrounded two trees. Then, Mink showed us our tree house, and I swear my jaw dropped. It was the kind of tree house you’ve imagined in your dreams. The rest of the village was just as stunning. The small resort gave us bikes to borrow for free to explore other areas. Since the village was so small, everything was easily accessible with the bikes. We biked along dirt roads and found gigantic, deserted caves that would have seemed scary if the placed hadn’t been so serene. We had the chance to walk into these caves, looking out for bats and seeing if there were any thai rock carvings on the walls. We were the only two there. Another place we found reminded me of a scene from the movie, Spirited Away. We found an abandoned village that had been deserted for years. Homes still scattered about the area, and it was dead quiet except for the sound of the wind whistling through our ears. The place was a lush green, with a small lagoon with a rope swing situated by the river. Of course, Angus and I had to jump in. The water was cool, crisp and the place was dead quiet. So quiet, it was almost creepy. But we didn’t let that scare us, and had a great time splashing around without a tourist in sight. Our few days at the Raebang Pasak Tree House came to an end, but our memories will of the area will last forever. It was an amazing place not just because of the tree house, but because of its location. It was so rural, you had no chance to running into heaps of tourists. You had the place to yourselves, and could enjoy the amazing natural landmarks the area has to offer, from bat caves, to view points, to lagoons and waterfalls, the area was a place I wish to come back to, again and again. “Two for one dollar, three for one dollar, four for one dollar!” The little girl with her basket of postcards trailed imploringly behind me. When l shook my head she repeated her plea in German and then Spanish. 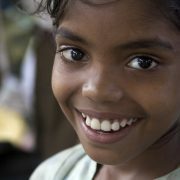 She was one of the hundreds of children that wandered the temples of Angkor Wat. Built during the reign of the Khmer empire, it is the largest religious monument in existence and has the honor of being named the 7th ancient “Wonder of the World”. Once a place of sanctity and worship it is now home to monkeys and barefooted children selling postcards to the throngs of tourists that flock there every day. I was one of those tourists and this was why l had come to Cambodia. l had arrived the evening before with my backpack and visions of haunting temples reflected in pools of lily-covered moats. Stepping out of the airport alone, not knowing where l would stay or who l would meet l was greeted by the setting sun sinking below the plains where the town of Siem Reap lay hazily in the distance. The potholed road into town in search of a hostel was a whirling chaos of bicycles, cars, and occasional cows, for 5 dollars l was given the grand tour in a tuk-tuk and my first taste of Cambodia. First impressions were the dust. Everything was covered in dust, having just flown in from the lush islands of Thailand, this far inland l felt claustrophobic. Arriving at the “Siem Reap hostel” l checked in and signed up for a 5am sunrise tour the next day. Then l traded my flip flops for runners and went to find some street food. In this respect, Cambodia did not disappoint. The streets were littered in food carts, where everything from fried ice-cream, fruit shakes, noodles or grilled meat could be bought. In a country where the currency is so weak, that they prefer to use Dollars then their local Riel, it almost felt like being in a pound shop. It seemed everything you enquired the price on was “one dollar”. 4:45 am the alarm rang and groggily l stumbled off the second bunk fumbling around for my clothes in the dark. I had spent the evening talking with my roommates until pure exhaustion turned my replies into mumbled incoherence. Making my way down to the entrance l exchanged nods with the two others who had signed up for the tour. 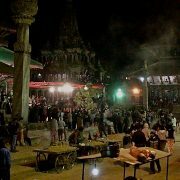 We were shown to our tuk-tuk, and the first 15 minutes we all silently sat in the dark watching the city fly by on our way to the temples. But soon the wind cleared our heads and we introduced ourselves. There was Neal the New Yorker with the ready smile and dark unruly hair and Felix the stoic Berliner, who would casually drop stories about being abandoned in Bolivia or trekking the Himalayas. These two would end up being my steadfast companions for the duration of our stay in Cambodia; we would get lost together, climb ancient ruins, eat crickets and scorpions, and stay up all night talking and drinking 50-cent beers in dodgy bars. Arriving at the temples we made our way to the sunrise viewpoint and patiently sat waiting for the sun to slip over the temples carved domes. The moment l had dreamed of was now a reality. Slowly we watched in awe as the cool dawn air turned thick with heat, the sun slowly burning away the mist. 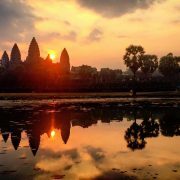 The pools of water reflected the temples like a mirror and the colors flared orange and red. Monkeys chattered in the trees beside us and you could almost imagine yourself thrown back to the days of the Khmer empire. All too soon the sun cleared the temples and it was over, the little girl arrived with her basket of postcards going from group to group her discount increasing with every shake of the head. I had been warned not to buy anything from the children as it encourages the parents to keep them out of school, but l couldn’t resist reaching for my bag of crisply wrapped caramels. Guiltily I passed her two. One for her and one for her brother who sat on a nearby tree stump, bare bottomed in a ripped Adidas t-shirt. She instantly scampered away and gleefully shared her sweets with the little boy who sucked on the wrapper and smiled at me, dark eyes crinkling with pleasure. The rest of the day Neal, Felix and I wandered the ruins and exchanged stories of travels and shared tips on where to head to next. It was a day filled with laughter and memories that will last a lifetime, we were so different yet shared the same passions and dreams and that common thread was like a bond that drew us together. Our religion or social status didnt matter, here we were equals, just as dusty and hungry for new experiences with that special spark that only strangers on the road together experience. After three days together we went our separate ways but it still amazes me how fast friendships form when traveling. Traveling alone is never lonely and that day two strangers became as close as lifelong friends and the moment we shared watching the sunrise over the ruins of Angkor Wat will always be with me.